Lapis lazuli. 1.25" (3 cm) tall. From a mail-order catalog. Hematite (iron ore). 1 7/8" (4 cm). From Gem Quartz, eBay. Quartz crystal. 2" (5 cm). From a mail-order catalog. Red Coral. 1.5" (4cm). From an eBayer in Mainland China. A very coool beanbag Lucky Cat. Just about as relaxed as you can be w/o falling asleep. Made from different types & colors of cloth & stitching. ID: a diamond-shaped set of characters, including a fuku "happiness" symbol, stitched onto his back, presumably either a blessing or the name of the company that made him. 3.75" (9.5 cm) tall. A gift from Roz in England, 2005. 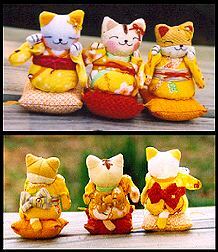 Nicely made Japanese cloth dolls in bright colors. Front & back views. 4" (11 cm) tall, cloth & rhinestones, no id, purchased new from an online store. A heavy Neko bell made of metal (iron?) w/ a red string for hanging. 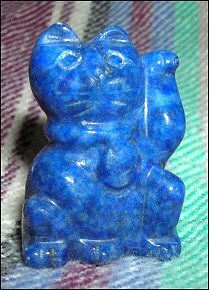 2.5" (6.5 cm) tall; bought new from a shop in San Francisco's Japantown, 2004. ID: a round gold sticker on the bottom saying "Kotobuki / So. San Francisco / Made In Japan". A beautiful metal wind chime bought new at the Sackler Gallery in Washington, DC (2007). The coloration is very unusual -- shiny yellow brass with powder blue shadings. Bell height 2 1/8" (5.5cm). No markings on the bell, but his blue, black, & white box says, "KOTOBUKI - South San Francisco - Made In Japan". 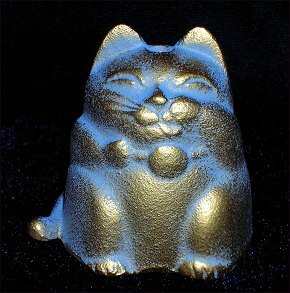 This solid gold (colored) Money Cat is covered with yellow crystals. And he has a secret -- a hinge about halfway down his back that allows him to be opened up -- revealing a black felt egg-shaped compartment for storing treasures. He's quite heavy -- made of some unknown metal, 3.25" (8.5cm) tall, holds a coin saying "Lots of Money!" & was purchased from Anna at the 2007 Cat Fanciers' Show in Memphis. 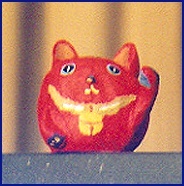 A bright red papier-mâché Maneki, 3" (7.5 cm) tall, with a red chop mark on the bottom. Very interesting -- her decoration consists of different colored papers glued to appropriate spots. From Old Japan's (Boston) web-store. 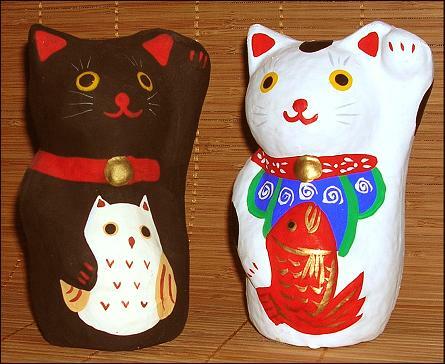 A brown folk-craft papier-mâché Maneki from Japan made & mostly decorated with pieces of different-colored paper. The only obvious places where he is painted are the black lines on his face & the gold & red ornamentation on his bib. (I can't help but wonder if the coiled red lines have significance.) Height 4.5" (11.5cm). No ID. Two more Lucky Cats! Both made of papier-mâché & 5.5" (14cm) in height. [Left] A Beckoning Black Cat holding an Owl. Why an owl? Hoo knows? (Sorry about that, lol!) The "lucky" owl here is actually a sort of Japanese pun. "Fuku" is a Japanese word meaning "good fortune" & "fukurou" means "owl". 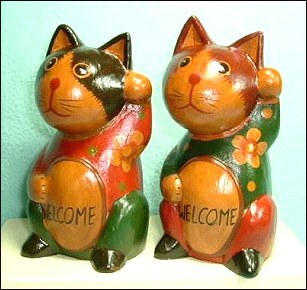 [Right] A white Welcomer Cat holding a Fish. No mystery there, but a perfect match to the first one. I'm guessing that they were made in the same Japanese town. 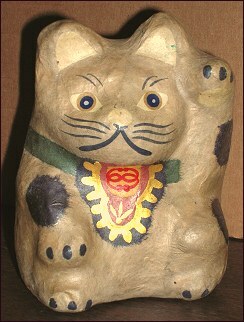 A large & unusual papier-mâché Neko crafted in Japan. Decorated with painted images & applied paper strips. 10" (25 cm) tall. Has several sets of characters (incl "TORI NOKI" in English) painted on the bottom. From eBay seller "waiapo" in Maui, Hawaii. 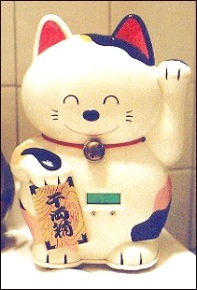 About as simple a Maneki Neko as you're likely to see. Tammy spotted this guy in a Paris, France shop window & brought him home to me. (2004 AD.) He's 3.25" (8.5 cm) tall, carved & painted wood. "Thanks, Tammy!" 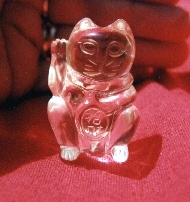 "The Godly Cat" is said to be a symbol of commerce & banking in China. This big boy was found in Suchow, mainland China. He's carved from bamboo & is about 11.5" in height. The abacus that he holds identifies him as "The Money Catcher". 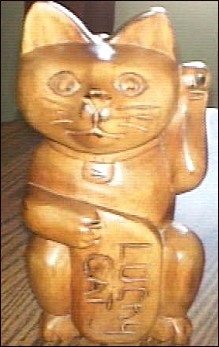 A couple of cute carved-wood Maneki's. [Not salt & pepper shakers.] My friend Diane has the left one w/ the red shirt & I have the right one with the green. 6" (15 cm) tall. "WELCOME" is painted on the shield. A white paper sticker w/ a simple cartoon has been stuck onto the bottom. From an eBayer in Taiwan, 2004. 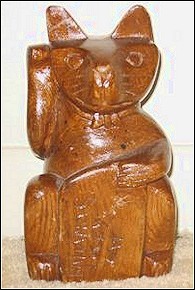 A present from my friend Barbara, this unusual-looking pair of Mom and Kitten are carved from wood, painted a red-brown color, and fantastically decorated with some sort of thick off-white paint (?) & also pieces of nailed-on brass. Height 9" (22.5 cm). With a paper sticker underneath stating "MADE IN INDONESIA". 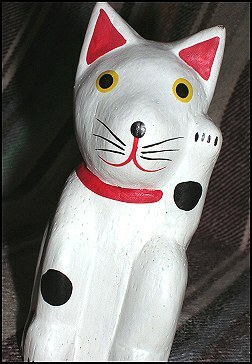 A bright red Lucky Cat with white polka dots! Carved & painted in a Bali-esque style, his maker & origin are unknown to me. 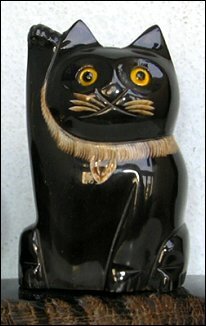 Solid wood, about 6.25" (16 cm) tall, with a flat-black painted bottom w/o markings. I bought him from a Texas antiques dealer via the "Ruby Lane" site. Please write if you know anything about this kitty or his maker. Wooden batik figurines from Thailand. Very unusual - I've never seen anything like them. The figure is carved and then goes thru a series of dunkings into the paints to bring out the patterns. The background is a reddish-black, the middle color is red, and the top color is tan. Amazing how much detail is brought out using only 3 colors. 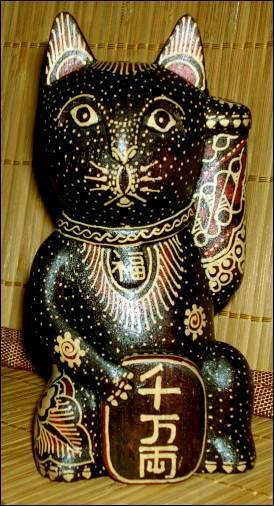 Beautiful work - I'm sure that Novica is very proud of it. 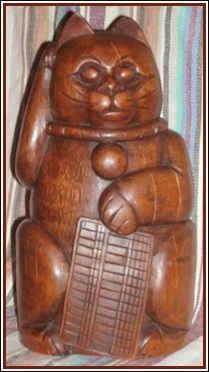 He's solid wood, 5 1/2" tall, and unsigned, although the patterns continue across the bottom. Since these figures come only in pairs, I've shared with my friend Marlene. 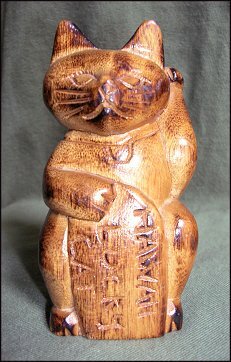 Small-sized (4.25" / 11 cm) with "HAWAII LUCKY CAT" carved into the coin. 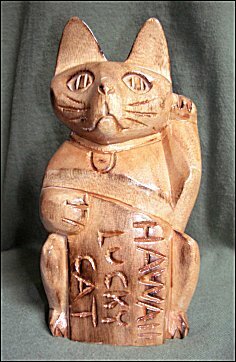 Medium (6" / 15 cm) "HAWAII LUCKY CAT". 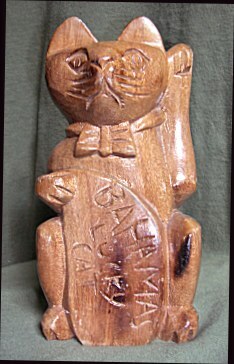 Medium (6" /15 cm) "BAHAMAS LUCKY CAT". 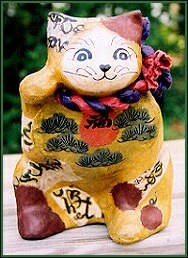 Medium-plus (6.5" / 16.5 cm), right-handed, "BAHAMAS LUCKY CAT". What I really like about these guys is that they're handmade from real chunks of wood, so no two of them are identical. What I really dislike about these guys is that none of them have any marks. 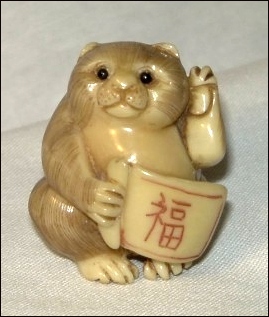 A little drummer cat netsuke hand carved from hippopotamus ivory. 1 7/8" (5 cm) tall, signed on the bottom by the carver, an eBay 2001 purchase. 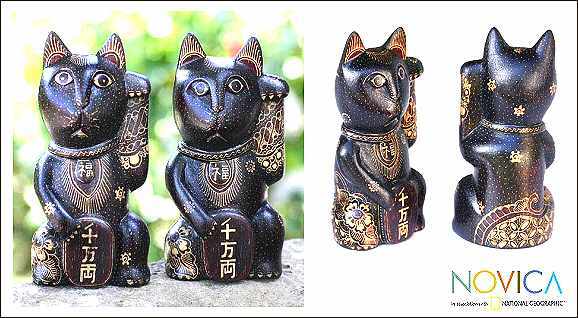 This Maneki Neko netsuke holds a scroll w/ the "fuku" (good luck) character on it. She has 2 holes in the bottom, plus the maker's mark & finely crafted little feet. She's carved from tagua nut "ivory" & has black onyx eyes. Size: 1.75" (4.5 cm). 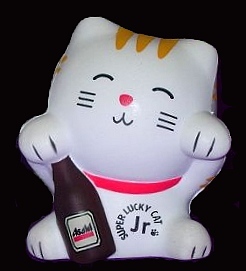 "Super Lucky Cat Jr" - One of the smaller models of the Asahi Beer Cat. This guy is made of painted squishy rubber, unlike most of the others, which are ceramic & cost a lot more. Junior is 3" (7.5 cm) tall & was purchased from an eBayer in England. Another advertising Neko. This one a keychain with a 2" (5mm) 2-sided plastic figure. (Unfortunately the 2 sides are identical.) Printed across him is "IDEXX Laboratories" - a Maine company offering diagnostics & infotech solutions for animal health and water & milk quality. A present from my vet-tech wife, Brenda. An unusual Neko from Singapore. 3.5" (9 cm) tall. Carved from buffalo horn. (I'm not sure what the eyes are made of.) This guy was once part of a tacky desk set that I disassembled. 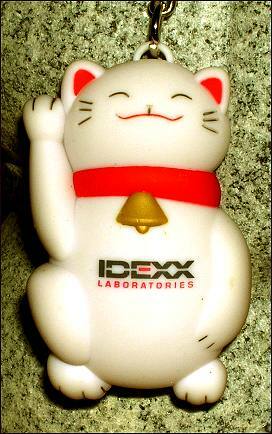 A Maneki Neko that runs on batteries. But he's not one of those common arm-wavers - he's a talking combo bank & clock. And he speaks Japanese! Besides his circuitry, he's made of painted plastic, a metal bell on a red cord, a speaker, & an LED with pushbuttons. Is this the waver of the future? (Sorry bout that, lol!) I bought him used on eBay. He's a 9" (23 cm) tall tricolor without any ID that I can find w/o taking him apart. Two good buddies:  The big white guy on the left is one of my largest Lucky Cats. 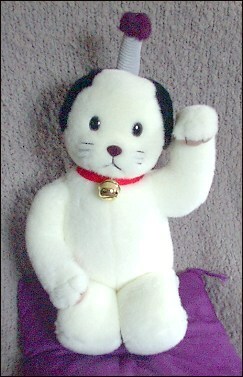 He's 14" (35 cm) tall, ceramic, & has long genuine plastic whiskers. 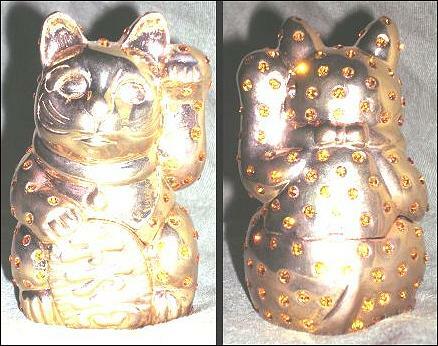 The Maneki on the right is a nicely-made stained glass lamp, wired for AC & ready to glow. He's 12" (30 cm) tall, made of glass pieces leaded together, & comes from Mongolia via a Bartlett, TN curio shop. When lit he reminds me of the robots in the movie "The Mysterians".